Road works. 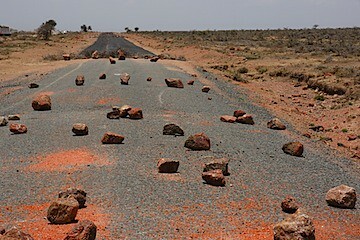 Spreading large rocks across the road is one way to ensure no-one drives on this new stretch. Another popular potion is the paying of green branches instead of using road cones or warning signs. At first we thought that a careless truck had damaged the roadside bushes, until we came around a corner and almost drove into the back of a steam roller. Candelabra Euphorbia, a completely useless tree as far as I can make out, consisting of a normal tree trunk with a bunch of cacti attached instead of branches. 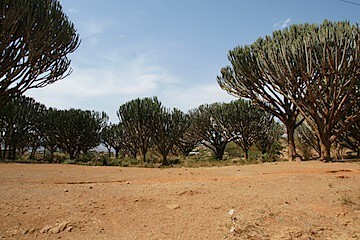 Honey made by bees collecting from these euphorbias is inedible as it burns the mouth and the fruit is poisonous. 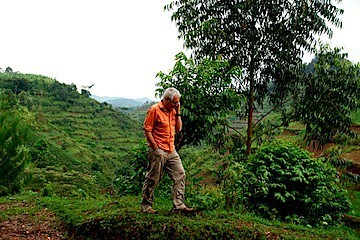 Stuart's last conference call with London took place on the side of the road at Bwindi Impenetrable Forest Reserve, amidst banana plantations and small curious village children.